Pneumatically controlled high pressure valves regulate the flow of the cutting water at the cutting head and thus are among those components of a waterjet cutting system which have to bear the most stress. Moreover, they fulfill an important role when applied as a safety dump valve in a high pressure pump. Considering these applications, high reliability and toughness are vital characteristics of the high pressure seal assembly. Therefore, an expert installation of these seals is of particular importance. KMT Waterjet has specifically developed a tool which easily enables the correct positioning of the seals at every installation thus guaranteeing optimal lifetimes of the seal assembly. Practical experience shows that seals in pneumatically controlled high pressure valves are often not installed correctly. This may lead to a faulty function of the valve – however, it definitely does lead to an increased wear of the seals resulting in reduced operating times for the complete cutting head or dump valve. As a solution to this problem, KMT has designed a special tool kit which guarantees the correct positioning of the high pressure seal whenever a replacement and new installation of the seal assembly is necessary. In this way, the productivity of the complete cutting system can be maximized. This holds true for abrasive cutting systems as well as for pure water applications – the latter often being characterized by very high switching frequencies, which put an extreme strain on the valve. 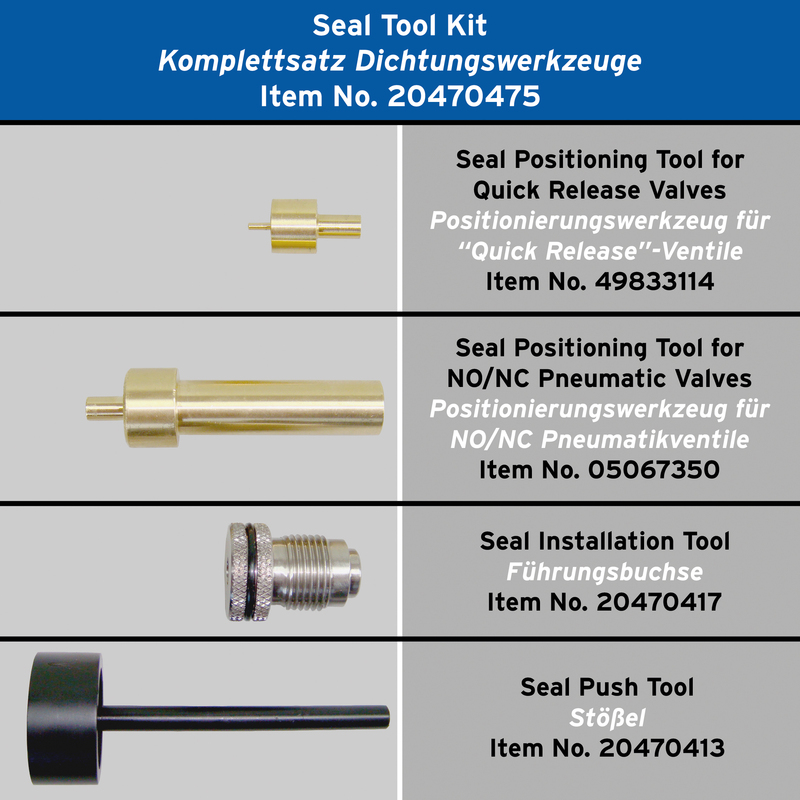 The tool kit consists of a seal positioning tool, a seal installation tool and a seal push tool. The seal installation tool is screwed into the valve body. The seal push tool serves as a support when inserting the seal assembly into the seal installation tool. The combination and design of the tools ensure that the seal assembly is automatically pushed into its intended position. The seal installation tool of the tool kit avoids a tilting of the seal assembly and prevents damages which may easily occur when installing it without special tools. So using the tool kit, the potential lifetime of the valve and with it the operating time of the complete cutting head can be maxed out. The machine operator can decrease the downtime thus optimizing the productivity of the complete cutting system. Starting 1 September, 2013, KMT Waterjet Systems has hired two new service technicians and reorganized the service team for the sales area Germany, Austria, Switzerland as well as the Netherlands and Luxemburg. So far, the customers in these regions have been supported from the main office in Bad Nauheim, Hesse – the new service technicians will serve the areas Northern Germany/Netherlands/Luxemburg and Southern Germany/Austria/Switzerland from their local home office. Of course, this results in shorter travel distances and thus quicker response times. Regular maintenance and quick response times of service technicians in case of a necessary repair increase the uptime and thus the efficiency of a high pressure pump for waterjet cutting machines. To be able to offer their customers the best possible support for both maintenance and repair, KMT maintains an extensive international network of service offices. For the sales area which has up to now been supported by the main office in Bad Nauheim, KMT has now employed two new service technicians. These serve their customers from local offices in Southern and Northern Germany. On 1 September, 2013, Manuel Gräf and Patrick Jakobus took up their employment in the service team of KMT. After a thorough training in the head office in Bad Nauheim, the new technicians are now starting to serve their respective areas of responsibility offering qualified and quick local service. From his office in Augsburg, Bavaria, Gräf is responsible for the area Southern Germany/Austria/Switzerland. Jakobus’ home base is his office in Gladbeck, North Rhine-Westphalia, from where he serves the area Northern Germany/Netherlands/Luxemburg. Of course, Gräf and Jakobus get comprehensive support by the experienced service technicians in the company headquarters.